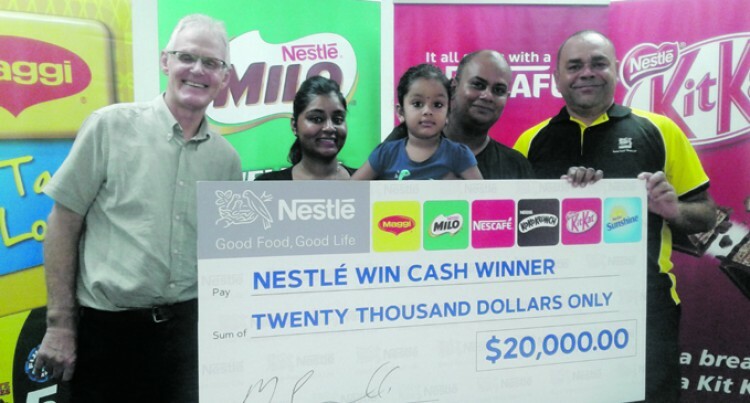 Nestle promotion winner Mukesh Prasad could not be­lieve he had won $20,000. He was given the first prize at the Nestle office in Wailekutu, Veisari, yesterday. Mr Prasad, who resides in Nakasi 10 Miles in Suva, took part in the Nestle promotion by sending in the Nestle brands barcode with receipts valued at more than $5. So he called his wife to confirm about the win with Nestle. “We were so excited about it after receiving the confirmation,” Mr Prasad said. He runs a small grog business and stays with his mother, wife and three-year-old daughter Anaaya Prasad. “I always take part in such promo­tions and this was my third win with Nestle,” Mr Prasad said. “I take part in promotions like this all the time, but I never thought that I will win such a grand prize. Nestle (Fiji) Country Manager Maurice Gunnell said: “We run pro­motions from time to time and con­sumers have opportunities through our brands to participate in our pro­motions and win prizes such as this. The Nestle promotion draw on May 10 had a first prize of $20,000 plus 10 consolation prizes of $1000.